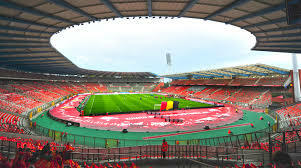 On Tuesday the Belgian FA and sports event agency Golazo backed plans to refurbish the old Heysel Stadium (also known as the King Badouin), which hosts Belgium’s home internationals and an annual Diamond League athletics meeting. The previous ‘Eurostadium’ plans had foundered as administrative procedures delayed and eventually killed off construction. The KBVB is banking on public financing in the range of €150-200 million for the stadium’s wide-ranging facelift.